Class of 2018 post Hannah Sadler of Lilburn, Ga., has shown herself as a versatile option in the post capable of running the floor in transition. 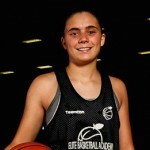 Brandon Clay’s takeaway – #EBASuper64 Showcase (June 2017): For a post prospect who is still relatively new to the game, Sadler’s skill and understanding of what she sees is impressive. Her physical strength and overall offensive completion rate will continue to improve at the collegiate level as she sees more and more game speed repetitions. Sadler’s foundation is solid as is her performance in the classroom. Keep an eye on her going forward. Jonathan Hemingway’s takeaway – #EBASuper64 Showcase (June 2017): Sadler has the tools to be a very effective player at the next level. She has the length to affect the game in the paint on both ends of the court. She can alter shots from opponents defensively, while also being a threat on the offensive glass. 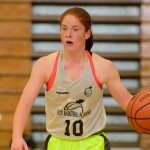 She has remarkable versatility in that she can hit perimeter jumpers as a true center. When she has time and space she can hit a high percentage from the elbow and short corner areas. In that way, she is a perfect pick and pop post player. She will need to continue to work on her physical conditioning especially in adding strength in her core. That will allow her to play in physical conditions when teams try to put bodies on her to deter her. ‘18 P Hannah Sadler (@Hannah_sadler24) of Parkview & Team Elite joined our program in June. ‘18 P Hannah Sadler (@Hannah_sadler24) of Parkview HS & Team Elite EYBL #PSBFamily is headed to Old Dominion. 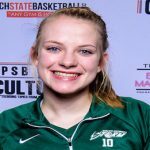 Available ‘18 F Hannah Sadler (@Hannah_sadler24) of @parkview_hoops & @niketeamelite1 added an offer from @WinthropWBB this weekend. UAB & UMass were out this weekend for Available ‘18 6’3” P Hannah Sadler of @parkview_hoops. Available ‘18 P Hannah Sadler (GA) had a big night for Parkview. Georgia Southern & UMass talked with 6-3 Available ‘18 P @Hannah_Sadler24 this week. 6'3" 2018 Post @Hannah_Sadler24 earned @KeilMoorePSB's praise. She's still available. 990 SAT. Has been blocking shots all day! '18 P @hannah_sadler24 of @hubbardcoach & @TeamElitebball has @KeilMoorePSB's stamp of approval. '18 P @Hannah_sadler24 (GA) of @HubbardCoach visited @bluehosewbb. She's a MUST track in July. '18 Hannah Sadler (GA) reps Team Elite & Parkview. Gogo & Juju Maduka, plus Hannah Sadler seem to be key for @TeamElitebball to beat FBC. They are WORKING down low.